Although my speaking tour for Adaptation: Building A Successful Photo Business in the Era of Smartphones, Tablets and Social Media, has concluded, I haven’t stopped thinking about how to apply the lessons contained in the presentation to businesses of all types and sizes. One of the key takeaways from the presentation is that the pace of change is increasing, leading to uncertainty and instability in our business and personal lives. The forces driving these changes, along with the effects of rapid change, are well documented. The effect on individuals is described in Fast Company’s brilliant manifesto Generation Flux and, on the business-level, in Deloitte Consulting’s Big Shift Index. In thinking about the ways companies can adapt to, and thrive in, a chaotic environment, I see three core areas business leaders need to cultivate to strategically position their companies to stay in front of the pace of change. It’s somewhat akin to a surfer riding a wave, rather than perpetually struggling to stay afloat. Knowledge: Lew Platt, Former CEO of Hewlett-Packard, is famously quoted as saying “If HP knew what HP knows, we would be three times as profitable.” The simple truth is that much of the knowledge within an organization resides in the heads of the employees where it cannot be accessed by the larger organization. Companies need to develop facilities for, and a culture that encourages, a diffusion of knowledge throughout the organization. Essentially, creating a “hive mind” where information, particularly situational or ground level information, is readily available to whomever needs it, whenever they need it. One critical component of this is the ability for information to flow “uphill” within a company, from the ground-level employees to the leadership teams. The practical insights and observations of employees who work on the front lines with customers, need to be distilled and delivered to decision makers who are guiding the organization. Learning: Individuals’ desire to learn and apply new information for their own professional development is a critical part of organizational growth and sustainability. Learning comes not simply from absorbing knowledge others have shared, but through experimentation, tinkering and hacking existing systems. Often, these experiments (and resulting failures) are driven out of an organization in the name of efficiency. However, the knowledge generated as part of the learning process is essential for promoting the larger body of knowledge within an organization and engaging the curiosity of individuals. 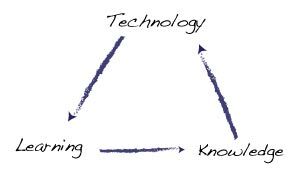 Technology: The third leg of the triangle is the rapid integration and adoption of technology. Imagine a new piece of technology hits the market that helps individuals perform a task faster and with less error than the current technology. The company that can test, integrate, customize and distribute the technology to all workers the fastest is given a productivity boost. Additionally, by rapidly bringing the new technology up to speed, the company is able to begin depreciating their technology investment and position themselves to purchase the next round of improved technology when it becomes available. The learning and knowledge systems within an organization play essential roles in making this rapid introduction of new technology successful. Employees accustomed to change and continuous learning are more likely to embrace, rather than resist, a technology change and the knowledge system helps individuals overcome, and resolve the inevitable problems that come with technology. I fully recognize that developing these systems, particularly the aspects that change employee attitudes and behaviors, are far easier to describe than to actually implement. This may be difficult, but it can be rewarding to employees and serve as a competitive advantage for organizations. In fact, the difficultly should be an attractor to business leaders who know other companies will be dissuaded by the challenges. In subsequent blog posts, I’ll discuss ways of establishing these types of routines on an individual level.